Grand Steel is not satisfied with being a traditional steel service center, we want to offer our customers the best flat rolled steel on the market. From our 50,000 square foot facility – housing the industry’s best steel slitting equipment – we have worked tirelessly to upgrade every step of our process. Whether you’re looking for cold rolled steel, electrogalvanized steel, or anything in between, you can be confident that our team can deliver. Well-trained and educated, our team maintains a firm commitment to quality, ensuring that you get the products that you need and – more importantly – that those products are up to your standards. As a way to display our dedication to quality, Grand Steel is ISO 9001:2008 certified, indicating that we’ve shown a commitment to continually improving our processes and products. Because of this, our customers can expect rock-solid consistency, as well as minimal variations and errors. We know how important repeatability is, especially to our customers, so we strive to meet – and exceed – our customers’ expectations. When you’re looking for consistency, though, you can be confident that our team has an unmatched level of control over every measurement and specification. 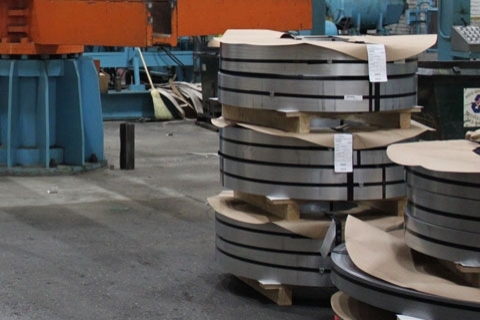 At Grand Steel, we have over fifteen decades of combined experience offering high-quality flat rolled steel, including hot dipped galvanized, galvalume, aluminized, and variations of both hot and cold rolled. Employing a team of experienced, well-trained, and friendly professionals, you can count on top-notch products and – more importantly – top-notch service. When it comes to fulfilling our role as the industry’s best equipped full line steel service center, we don’t make any compromises! If you’ve been searching for a new source for your flat rolled steel, we encourage you to browse our site and call us to discuss any questions that you have!